I think this post might be better categorized as Have “Science” Will Travel. A few weeks ago I went up to Maine to see some nature and get my lobster on. In my search for interesting things to do, I came across the International Cryptozoology Museum. At first I thought it was a museum of micro-organisms (my grasp of Greek prefixes may not be what it should)…but oh my, it was so much better than that. Cryptozoology is actually the study of and search for animals whose existence has not yet been proven (Like Nessie…or Bigfoot). The museum has models and exhibits of many of the most well-known cryptids (term for these not yet proven animals) and some of the more obscure. 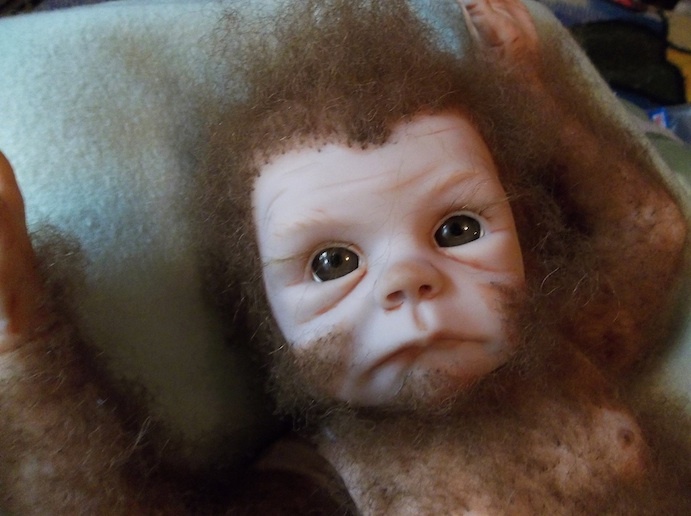 One of my personal favorites is the model (above) of what a Sasquatch baby might look like. 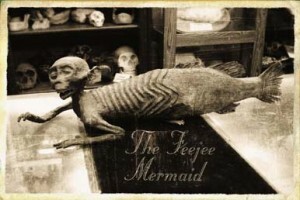 They also have a delightful mummified carcass that is similar to the Fee Jee Mermaid attraction advertised at carnival sideshows in the early 1900’s. This typically consisted of a monkey torso stitched onto a fish. There is also a large section devoted to the Bigfoot footprints that have been found in several areas of the country. There’s even a section devoted to the Bumble (of Rudolph the Red-nosed Reindeer fame). If you find yourself in the North-Eastern US, this museum is definitely worth a visit, even for a non-believer. This entry was posted in Have Science Will Travel and tagged bigfoot, bumble, cryptozoology, Mermaid, nessie, Rudolph the Red-Nosed Reindeer. Bookmark the permalink.